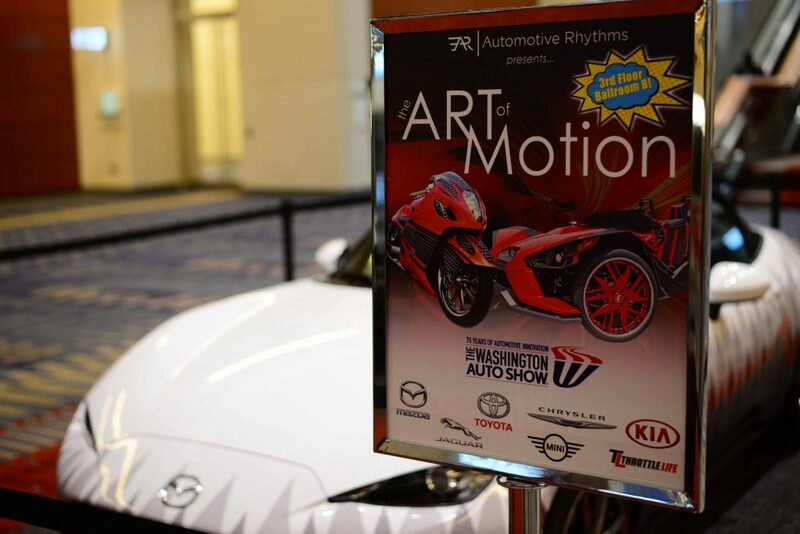 Welcome to the 2nd Annual ART-of-Motion “featured display” which set the 3rd floor of the Walter E. Washington Convention Center afire during the 2017 Washington Auto show. 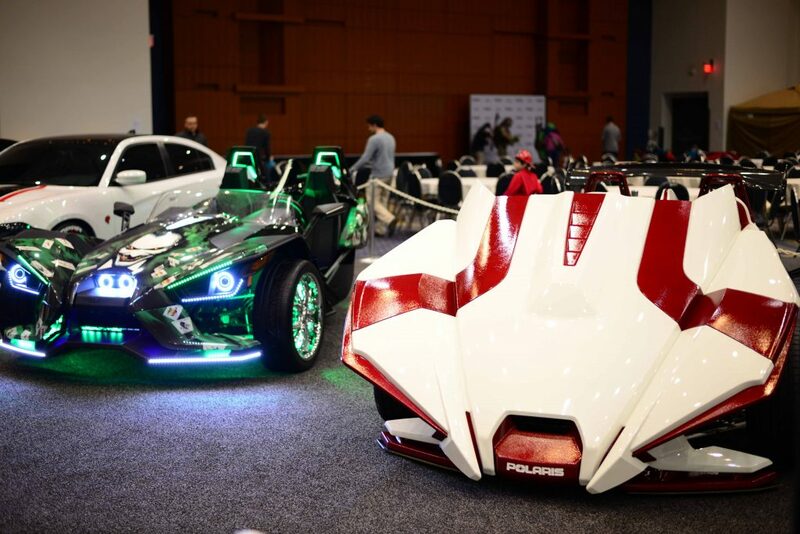 Manifested by Automotive Rhythms (AR) — our trendsetting urban automotive media group — the cutting-edge, graphic presentation highlighted more than 13,000 square feet of engaging and creative eye candy consisting of motorcycles, slingshots, luxury autos, hybrids, fashion, and murals. The emphasis was centered on AR’s talented cadre of painters who showcased their visual skills live for attendees to witness and enjoy as white vehicle canvases where transformed into arts of motion. 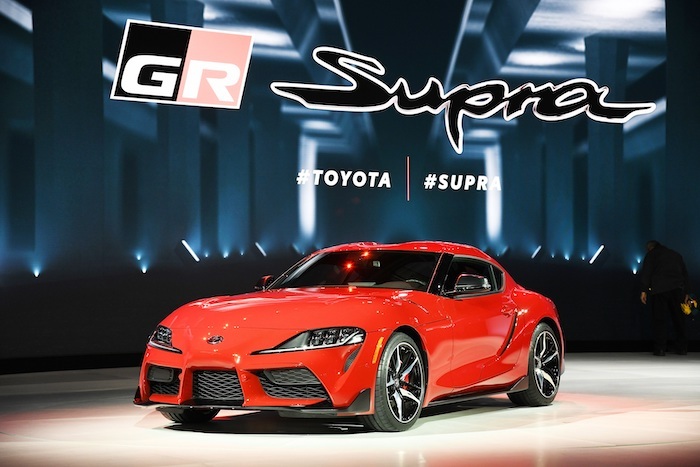 “Undeniably an enticing attraction for a consumer show, this automotive spectacle portrayed automobiles as we understand them: works of impressive beauty and innovative design,” said Kimatni D. Rawlins, president and publisher of Automotive Rhythms. 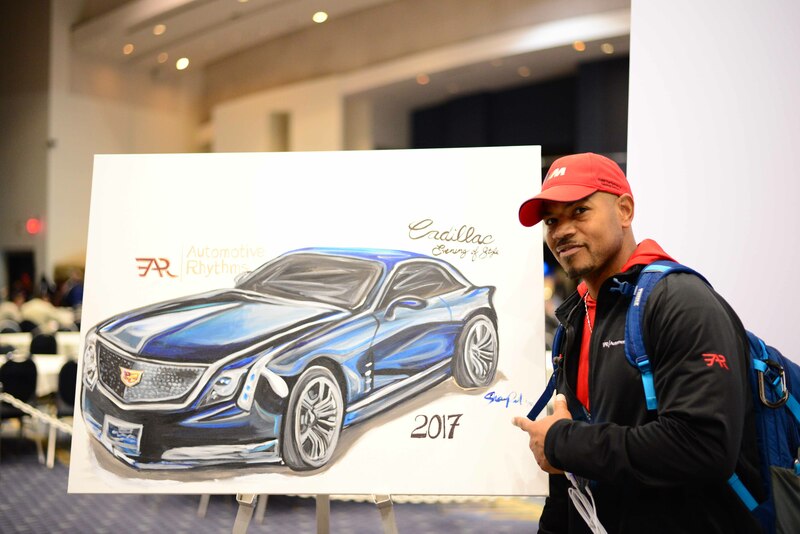 To kick off the festivities on media day Jamaal Newman aka “Jamaal Lamaaj” offered his famed realism style for creative works by displaying his artistic talents on the Fit Fathers 2016 MINI Cooper. 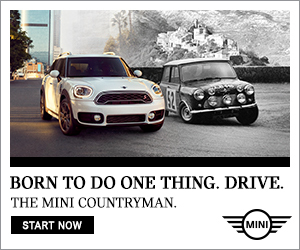 A cartoonish combination of the Incredible Hulk and Gotham City’s supervillain — The Joker — were imagined on the sporty vehicle to purposefully convey the message that MINIs are no joke and pack a powerful punch of performance-oriented enjoyment. He also hosted a student session regarding the artistic process of painting on cars. 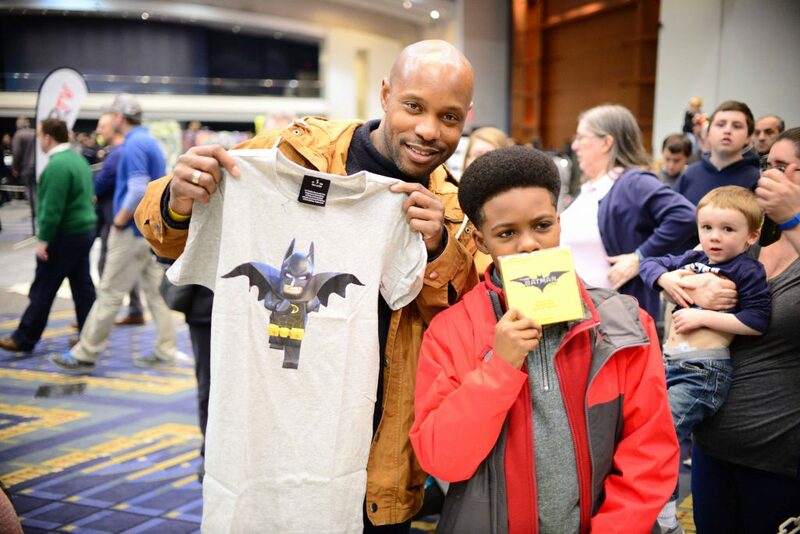 Leading the charge was the P.A.I.N.T Institute and their workshops educating young, creative minds about artwork on canvas, mural, and vehicle backdrops, which simultaneously introduces them to various STEM topics and alternative careers in the arts. 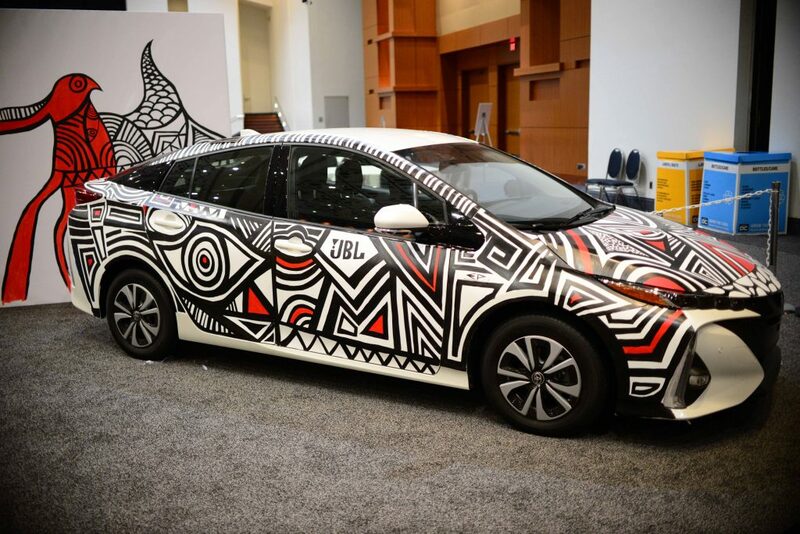 Nationally celebrated Edward Joseph aka “Ed the Artist” is an abstract visualizer specializing in lines that seek influence using shapes, forms, colors, and textures as evidenced in his work on our 2017 Jaguar XE and 2017 Toyota Prius Prime infused with sound bites of Entune Premium JBL audio with GreenEdge speakers. The popular Prius looks and feels like something different and eco-conscious so Ed highlighted it with energetic and vibrant Aztec-ish patterns. 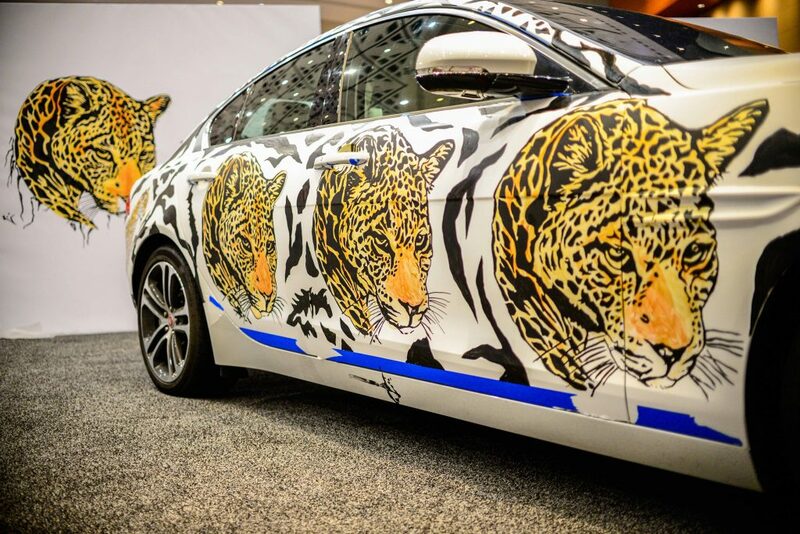 The XE was illustrated with Ed’s desires to interactively bring the animal kingdom to life. 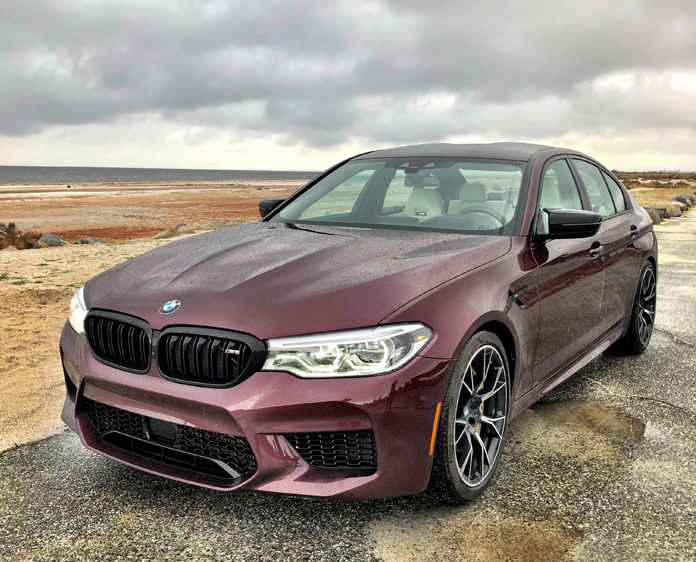 Literally, he tagged the Jag with a family of faces from the genus Panthera to honor the big cat’s powerful mantra and traditional roaring antics. With a wide head, compact physique, and strong jaws the Jaguar is the largest feline in the Americas. The XE finale aptly flaunted Ed’s perceptions. 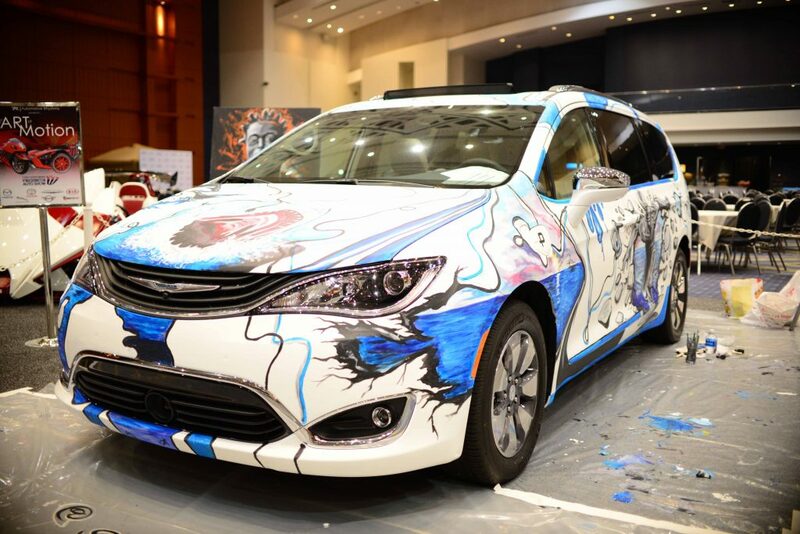 Portraitist Shawn Mitchell Perkins dubbed “SP the Plug” brought his methods of abstract, graffiti, and accuracy of simulation to ART-of-Motion using a combination of oil and acrylics on the Chrysler Pacifica Hybrid of the future. He regenerated Marvel’s Silver Surfer on the left body side (plug-in side) of the minivan to offer the superhero the energy required to satisfy his thirst for limitless power surges. Interspersed throughout the family passenger vessel were earthy themes such as oceans and vegetation. Shawn also let showgoers’ kids paint on the Pacifica Hybrid throughout the duration of the exhibit. A special thanks to JBL for keeping Shawn and Ed laced with the latest Bluetooth, over-the-ear headphones so they both could perform while entertained. Suite Nation recruited up-and-coming, Washington, DC based artist SUPERWAXX who executed her talents on Automotive Rhythms’ long-term 2017 Kia Cadenza with a bold design influenced by animation, comic books, pop culture as well as a mix of street-savvy art. 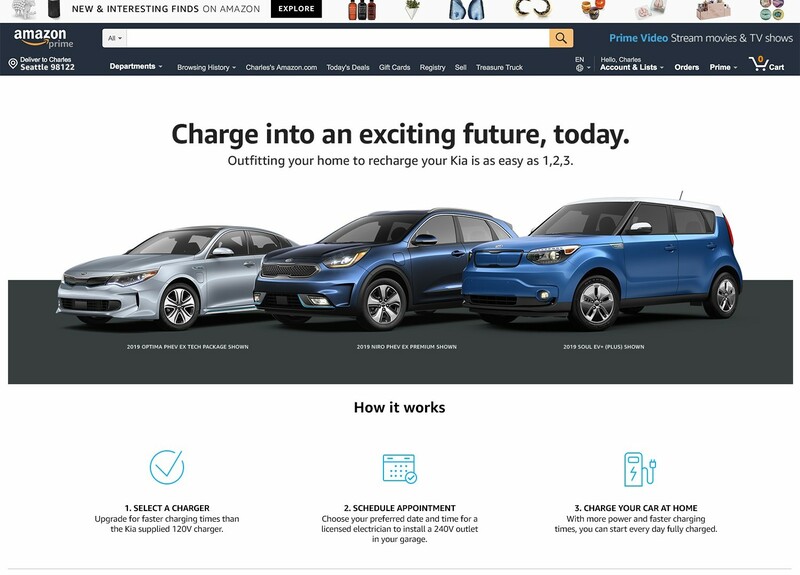 Entitled SUPERK!A, the project is a visual narrative that celebrates Kia’s influence on the automotive industry and is inspired by their roots and motorsports program. 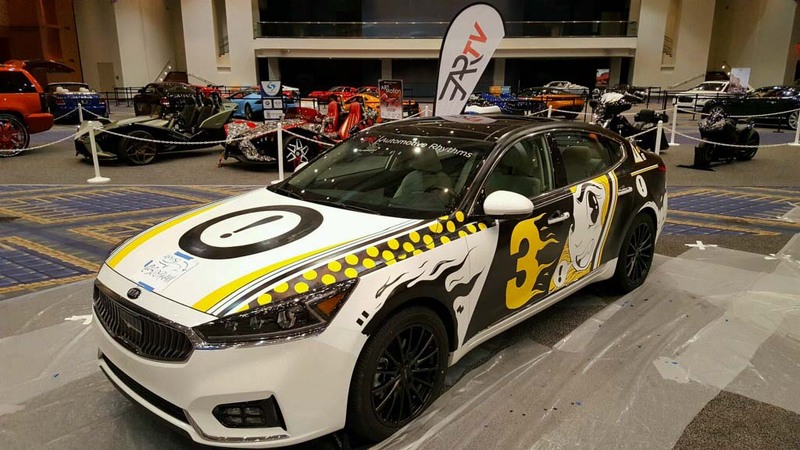 The end result reflects the artist’s bold and animated signature style by referencing the imagery of traditional Korean script, vintage race car patterns, and retro cartoon aesthetics that fuse Korean ethos with the Kia legacy. 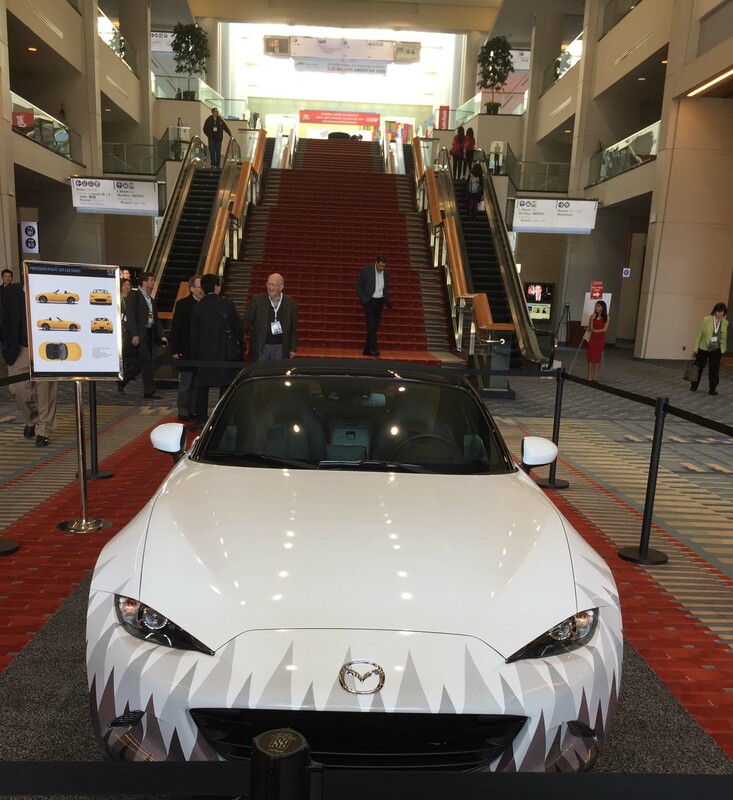 A specially wrapped Mazda MX-5 sat proudly in the Washington Convention Center lobby to introduce and direct ticket holders to ART-of-Motion. For 2017 Julien Montousse, director of design at Mazda North American Operations, challenged Georgetown University and Northwestern State University Professor L. Collier Hyams and his students to create designs based on the theme “reflection based surfacing.” From approximately 100 resulting images Montousse chose two winners: Jessica Cross’ 1st place Kisatchie Forest and Racheal Gaude’s 2nd place Honey Bubbles. 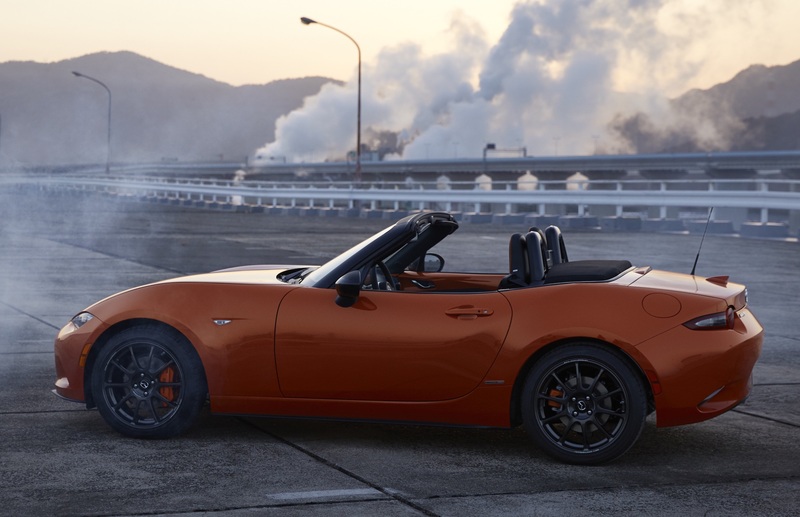 Both themes approached the project by reflecting and addressing the environment that a 2017 Miata would be traveling through. 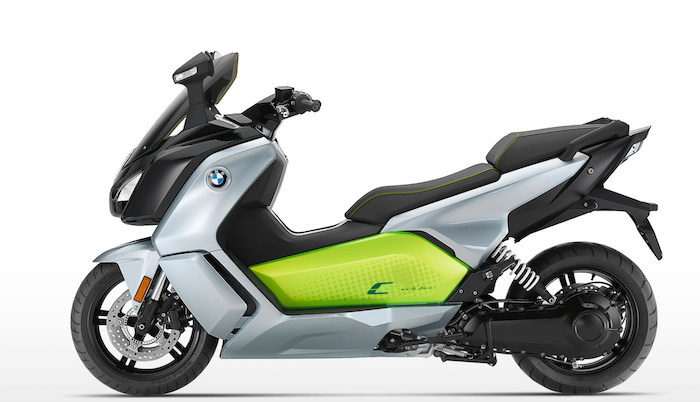 Cross was inspired by a Louisiana national park and the 1977 BMW art car by Roy Lichtenstein illustrating the racetrack at Le Mans, France. Gaude was stimulated by her father’s beekeeping and the plight of the honeybee. Hyams and his students traveled to DC to participate in ART-of-Motion where they exhibited the Kisatchie Forest wrapped Miata and six accompanying student art car designs printed for display around the auto show. In addition to the array of vehicles on deck, sophisticated fashion models from KennyKAS Custom posed stylishly while fusing couture and entertainment seamlessly as they provided the perfect complement to leave attendees in awe. Other attention grabbers that captivated included customs such as the McLaren 650s from IAP racing, our blazing sunset orange Chevy Tahoe, an iconic Porsche Livery, Audi S7, Nissan GTR, Nissan 350Z, Dodge Charger Hellcat, BMW 650, and Tesla Model S. And of course we had to include the two and three wheel creations with a bevy of custom Polaris Slingshots, the ice blue to gray gradient Harley-Davidson Road glide designed by Camtech Custom Baggers, a thunderous Harley-Davidson Street Glide from Artistic Custom Kreations, and a stealthy custom Yamaha R1 from MSP Motorsports. Additional appreciation goes to APAC Auto, Street Dreamz, SS Takeover, Coleman Powersports, and Wise Customs. ART-of-Motion also featured Chris Turner, an automotive care specialist, who gave edifying tutorials to patrons of the show. These sessions educated automotive enthusiasts in the area of appearance enhancement and maintenance of their vehicles. Chris is 1 of 130 installers worldwide that are qualified to install CQuartz Finest paint protection. 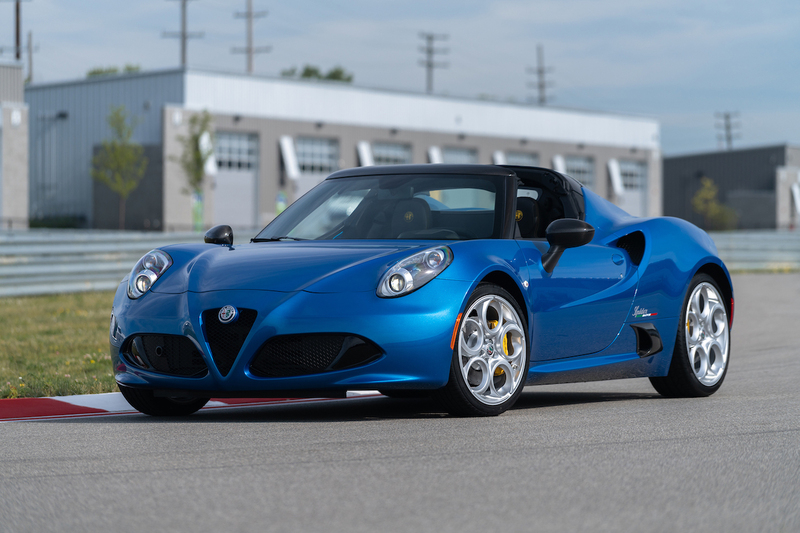 He is also the automotive care specialist for a few of the luxury vehicles that participated in ART-of-Motion. Rounding out show activities on the closing weekend we welcomed The LEGO Batman Movie team by setting the perfect backdrop with a Joker themed Slingshot courtesy of owner David Harich as they awarded games, prizes, shirts, posters, and other giveaways to our attendees. TV News coverage was heavy from stations such as NBC 4, Fox 5, ABC 7, News Channel 8, CBS 9, and many more. 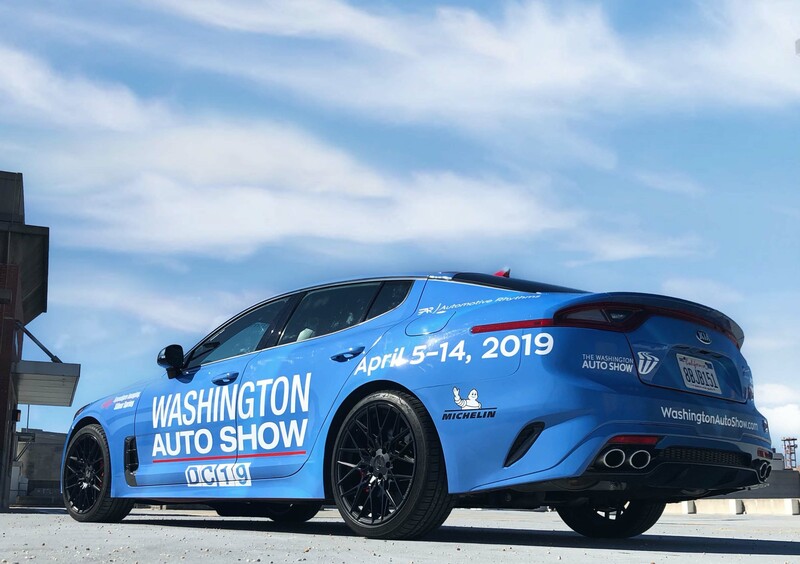 As exciting as this year’s installment was, team AR is already anticipating the 3rd Annual ART-of-Motion Exhibit at the 2018 Washington Auto Show. Thank you John O’Donnell for the opportunity! Please enjoy our photo gallery.